This feature was sponsored by our friends at Bob’s Red Mill. All opinions are my own. Okay it’s summer. You’re hot. It’s hot. We’re all hot. We’re busy. We’re going in a million directions and we ain’t got time to make almond flour waffles before we head out to the office, right? 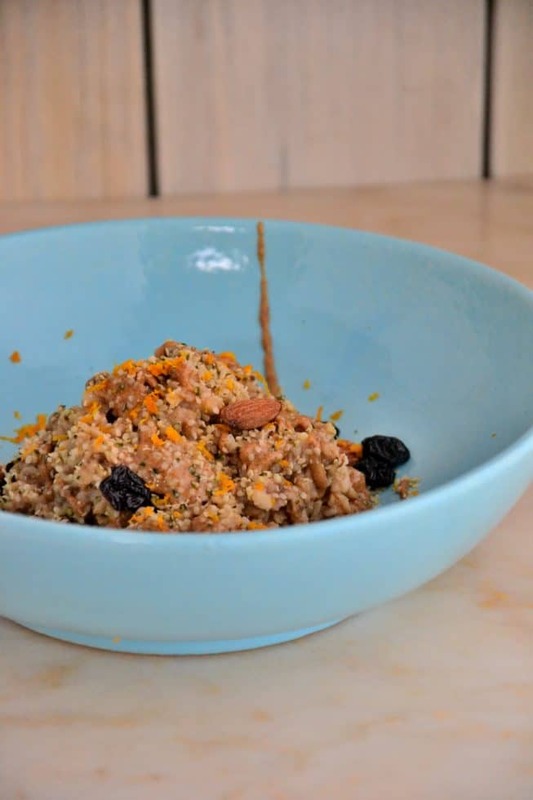 So, instead of grabbing a processed breakfast bar that’s full of inflammatory ingredients,I’ve got a simple pick-me-up powerhouse that will fuel your morning. Because after all, breakfast is the most important meal of the day. Did I mention there’s chocolate inside? O and I should mention, there IS chocolate inside. But no sugar! How’s that for a summer treat? Let me show you just how it’s done. You’ve all made oatmeal before, I’m sure of that but have you made an oatmeal that’s loaded with flavor instead of just plain old tap water and oats? That sounds awfully boring to me and if you want to fuel your body (and your mind), depriving yourself of flavor is an easy way to get bored with clean eating and give up or possibly run out of the kitchen to find the closest sugary snack. You’ve gotta focus on flavor, folks. Flavor is where it’s at. That’s the only way I survived the last 10 years of my health journey. When I had to cut out gluten, dairy, soy, sugar and all the other inflammatory ingredients, I felt like my taste buds went into a deprived state- and so did my body. My goal is to help you not go there because it’s a scary place where you’ll feel like giving up and your overall body will be suppressed. That’s not where I want you to be this summer. Or ever. You deserve more. Which is why this breakfast is here to jump-start your day with a whole lotta flavor, protein and fiber. If you have the belief that clean eating is hard and boring and flavor-less, well then that’s what you’re going to get. Shift your mindset, change your beliefs and get yourself into a state of knowing that you can make a difference in your life starting with one simple meal. 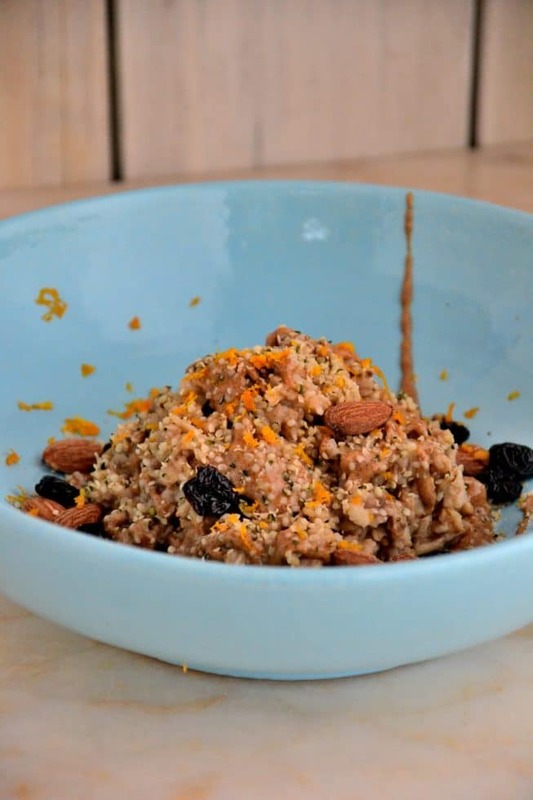 The reason I added the orange zest, hemp seeds, Chocolate Protein Powder, almonds and no-sugar added dried cherries is because I want you to have F-U-N and to play with your food. The only way you’re going to know what you like is to try new things and play around with fun additions like the ones mentioned above. You don’t need to use them all, but they’re each filled with natural sweetness to get your taste buds away from sugar and onto more wholesome, natural foods. So, as we move into the hot days of summer, remember that you can always create flavor- even if it’s 90 degrees outside (and inside, ha). 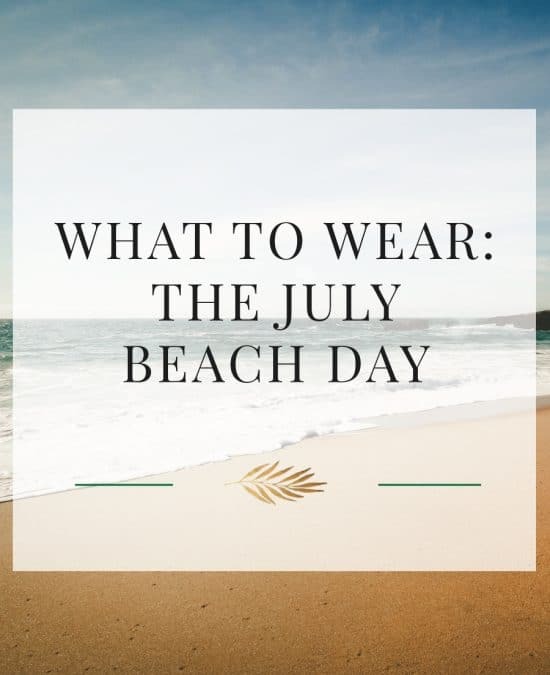 Hopefully you have air conditioning. If not, sit in your bathtub with ice cubes and have a fan on you. Then, when you get out, you’ll wanna eat a bowl of this. 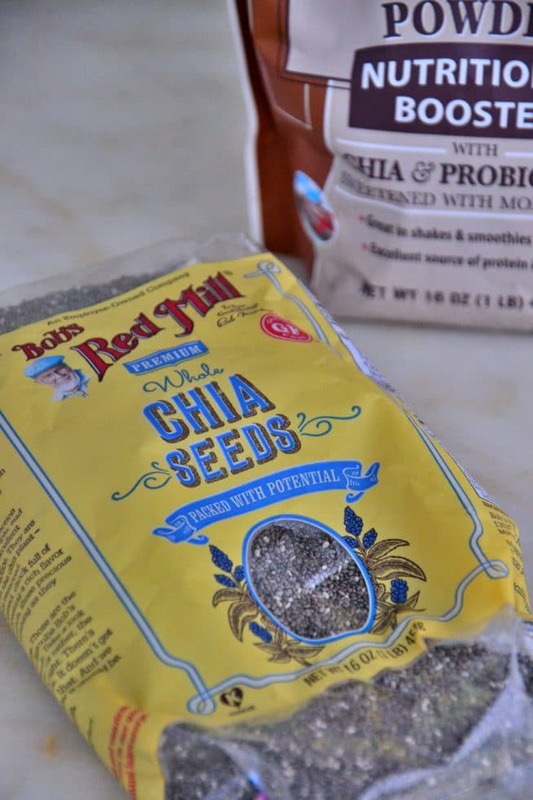 My best advice before you dive into this baby is to purchase a bag of the below items (I buy most of these from Bob’s Red Mill, which is my go-to for my pantry items) so that you have them on hand for this recipes and other recipes where you need a flavor boost. Feel free to use any of these ingredients in the below recipe, as well. And, of course, have F-U-N.
Bob’s Red Mill will be providing a gift set of these three products for one lucky winner- US and Canada only. To enter, leave a comment below telling me why you’d like to win these products. One winner will be chosen on July 15th, 2017 after 5 PM EST. 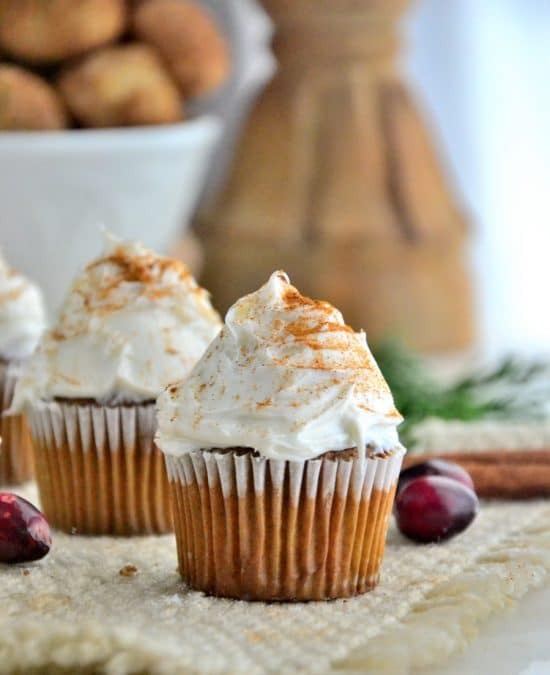 Good luck and enjoy this recipe! If you make this recipe, come show me by posting a picture of your food to your social media account and tag me so I can take a look! I love seeing your creations on facebook, pinterest, instagram, twitter and google plus. Free of gluten, dairy, soy, sugar, eggs, corn, peanuts. Vegan, Vegetarian. In a medium saucepan, bring the almond milk to a boil. Add in the oats and lower the heat to medium and stir to combine the oats and the milk. Add a pinch of sea salt and mix again. Cook the oats for 5 minutes or until they're tender and the almond milk is absorbed. 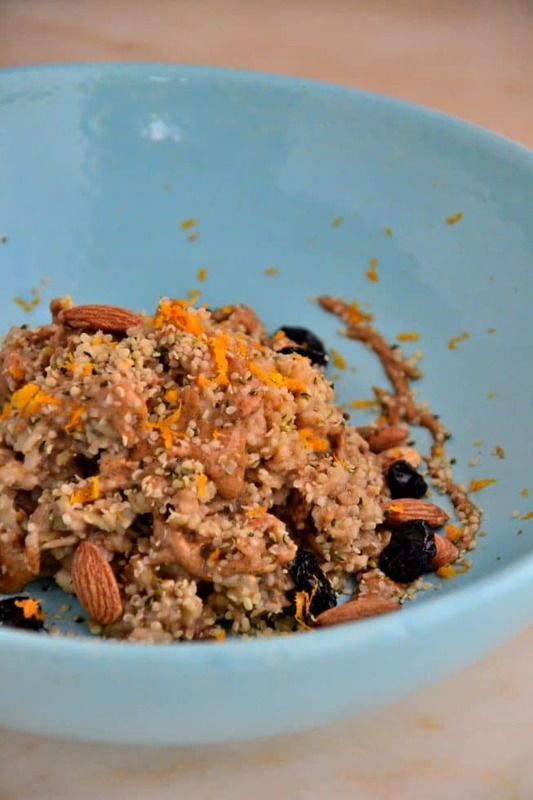 Before you remove the oats from the stovetop, add in the chia seeds and mix well. Remove from the heat and add in the chocolate protein powder immediately; mix well to combine, transfer to two serving bowls and serve warm. 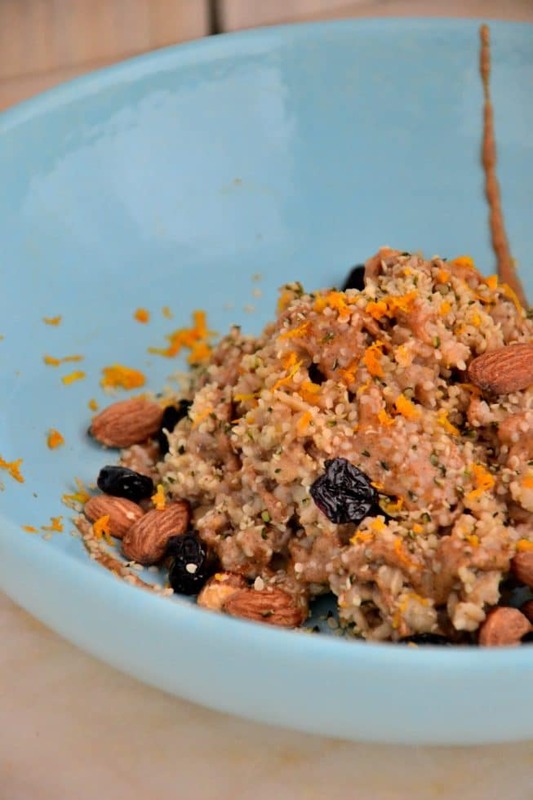 Garnish with almonds, hemp seeds, dried cherries and fresh orange zest. This post was sponsored by Bob’s Red Mill. All opinions are my own. I would love to win this gift set. I’ve been helping my mom make healthier breakfasts and snacks to try. This would be perfect for trying all our new recipes! Amy I need to try this protein powder. I have tried 4 different expensive protein powders from people who are pushing healthy eating, paleo, etc and I hated everone one of them. I can’t stand the after taste and they were all the sane aftertaste though some were whey, hydolyzed beef, or pea protein. I am wondering if the monk fruit would be my savior. I have SIBO and adrenal fatigue. Thank you for your resources. Best to you. I’m wondering if this recipe can be made as “overnight oats,” i.e., assembled the night before, then heated in the microwave for 90 secs. or so. Also, are these rolled oats gluten free? I understand that not all are. It looks like chickory is an ingredient in all the Bob’s Red Mill protein powders. I have been sensitive to certain FODMAPS, including chickory, though these sensitivities may be temporary so I’d want a small sample to try before buying this in quantity. I LOVE their protein! Thanks so much for the chance to win a few free goodies! I love Bob’ Red Mill products. I use them all of the time to make healthy recipes. I love all of Bob’s products. I am always looking out for new plant-based protein powders with clean ingredients. This oatmeal sounds delicious! Thanks for an interesting recipe! I’d like to win these products because I’m looking for new breakfast options that are healthy and will keep me satisfied and energized until lunch. I want to win because I’m always looking for (yummy) ways to get more protein. I’d like to try this protein powder as well as the other Bob’s Red Mill products. I’ve been adjusting to a gluten free diet after a season of depresssion, a bout with shingles and gluten intolerance. Eating clean whole food has been a priority for years, but since dealing with these issues on a more severe level earlier I’m enjoying the benefits of being consistent and maintaining a healthy lifestyle. I have a lot to learn & appreciate the info you provide. Why do I want to be the winner? Easy… Bob’s Red Mill products are amazing. I love gluten free oats. My favorite!!! I would love to win this because I already use Bob’s Red Mill products ALL THE TIME! I should basically have stock in the company already, haha. But the reason I keep coming back to them is because it is a company that makes quality products that I trust. I like knowing what goes in to my body and this takes the cake! Yum!! I love Bob’s Red Mill products. Would love to win so I can eat more oatmeal! Thanks! Ii would love to win these products to support my healthy eating lifestyle! I have tried various vegan protein powders all of them sweetened by stevia that has an unpleasant after taste. I would love to try Bob’s Red Mill protein powder! Thanks for the opportunity to win theses products. I’m gluten free and vegan and it so hard to find quality products! I’ve never tried Bob’s protein powder and I’d really like to try out the product. They are so reliable and I use their cornmeal, almond meal and flax all the time. Would be so excited to try this recipe and the chocolate protein! I haven’t seen this anywhere yet in Ottawa, Canada. Too hot to cook, and running my blender in the morning for frozen smoothies wakes up my sleeping (monster). um. Teens. Thanks for the chance to win! I’d love to win these products because I’m trying to experiment with easy, nutritious, make-ahead breakfasts that I can bring to work on busy days. This recipe looks amazing and getting most of the ingredients would be a real treat 🙂 thank you! I have recently been diagnosed with a gluten and rice allergy so I am searching for healthy eating options. Hello, Aimie. I’d like to win some of ” Bob’s Red Mill Organic Old Fashioned Rolled Oats because I’ve been eating much better since reading your posts on Facebook. Living once means live healthy. Thanks. I travel by car for weeks at a time as part of my job, and always make a big batch of energy bites to take along. They’re great on the road, but also as a snack during busy days. Many of these ingredients find their way into my bites, and it’s time to restock! Thanks, and cheers. I am so happy to have found you on Pinterest. It can all be so overwhelming researching what to eat and what not to eat and you have provided everything for me! I have been dealing with many chronic issues over the past 9 years and am ready to start healing myself the right way. I plan on purchasing all of these ingredients either way, but winning them would be superb! This recipe looks great and I believe that even my children will enjoy it which is always a “mom win”. Thanks for the chance! I would love to win these as I learning to nourish and support my body! WOW!! This sounds wonderful, I’m trying to find a breakfast recipe to get me going in the morning and not give me a crash mid morning. I love oatmeal and chia,and I’ve been reading up so much on the benifits of hemp, especially with chronic pain. I’m trying to find ways of curing myself with food and clean eating. What a way to start my day! Thanks for this info and contest! I love all your products. I would love to win this because I have enjoyed every single of products and with this I could actually make a meal that I’m 100% sure I won’t get sick! Thank you the opportunity. 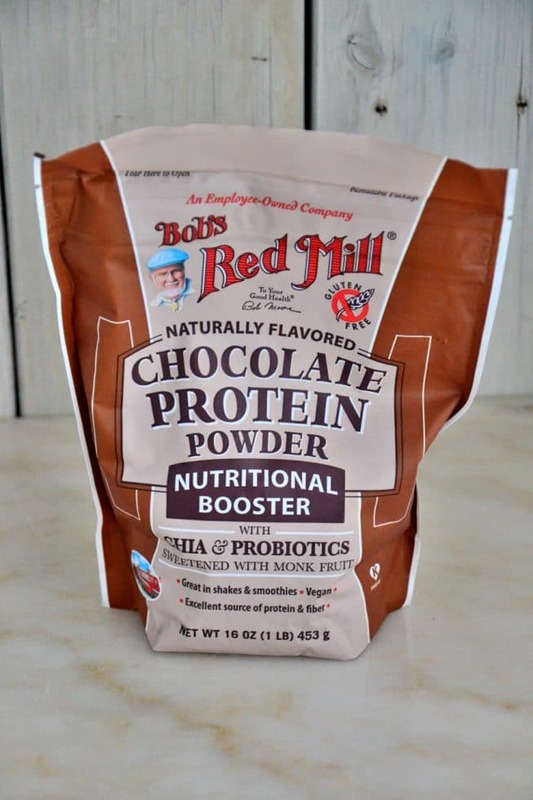 I have never heard of a bob red Mills protein powder, but I am a very active mother of 3 children and would love to try a healthier protein powder. Right now I am using Vega protein after my runs in the morning. I actually purchased it on a very good sale. I like it, but also find it somewhat “chalky” . I would absolutely love to give Bob Red Mills a try! I love their products. Thanks for the wonderful opportunity! I would love to win these products to start stocking my anti inflammatory pantry! I am beginning the healthy, nutrition based journey to ease my arthritis. I do not want to take drugs to get relief! Thank you for coming into my life just as I was beginning to search for help. Love Bob’s Red Mill! I came by the site looking for online vendor recommendations, so this was helpful. Like Jocelyn, I plan to buy these anyway, but winning them would be even better! Breakfast is the most important meal of the day and these items from Bob’s Red Mill would ensure that I’m well fueled for my active lifestyle. Right now I’m training for a fall marathon and could benefit from the added nutrition. I’d love to win this! I usually buy Bob’s red mill products on my weekly trip to Sprouts cause I trust the brand and the quality is always good. I’d like to win the gift set because this recipe sounds excellent an I want to make it. I would love this because I am trying to eat healthier and lose some weight! Thanks for the chance! I’d love to win these to try out some new, healthy ingredients. I’ve recently lost 33 lbs and am doing my best to not fall into the same old trap by reverting to eating foods I used to eat. That’s why I’m interested in some new ideas/foods. I would love to win the free gift. I have been changing the way that my family eats for better health. I am always looking for recipes that are healthy yet taste like they are not, I am excited to try some of your recipes.